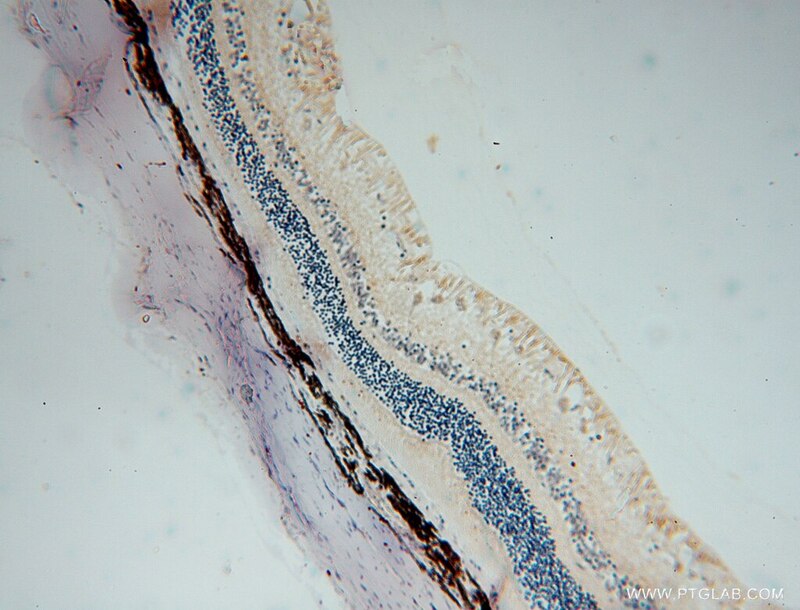 Immunohistochemical analysis of paraffin-embedded human testis tissue slide using 15910-1-AP( ALDH1A1 Antibody) at dilution of 1:200 (under 10x lens). 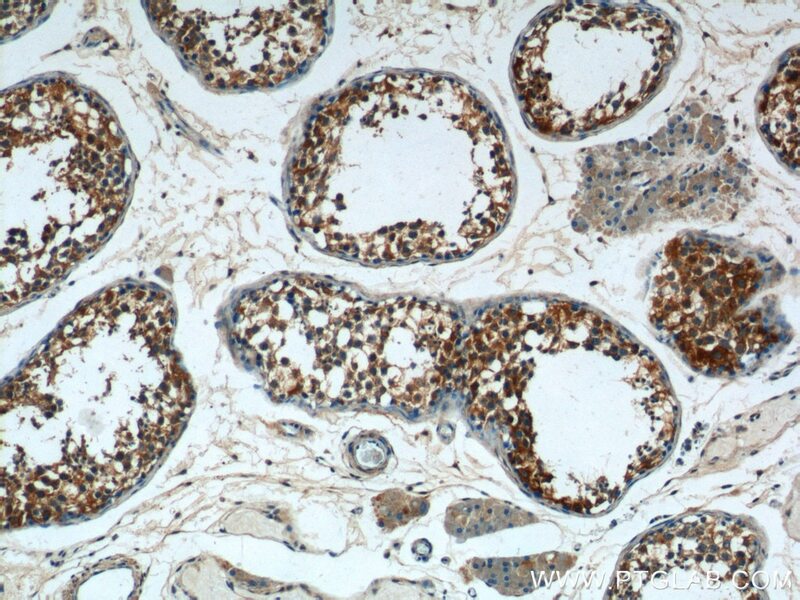 Immunohistochemical analysis of paraffin-embedded human testis tissue slide using 15910-1-AP( ALDH1A1 Antibody) at dilution of 1:200 (under 40x lens). 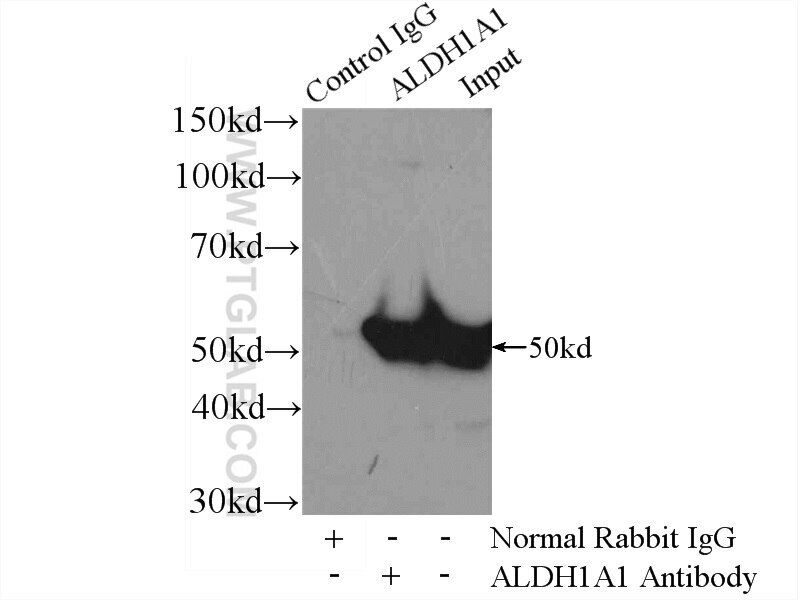 IP Result of anti-ALDH1A1 (IP:15910-1-AP, 4ug; Detection:15910-1-AP 1:500) with mouse liver tissue lysate 6400ug. ALDH1A1(Aldehyde dehydrogenase family 1 member A1 ), also named as ALDC, ALDH1 and PUMB1, belongs to the aldehyde dehydrogenase family. The ALDH1A1 gene encodes a liver cytosolic isoform of acetaldehyde dehydrogenase, an enzyme involved in the major pathway of alcohol metabolism after alcohol dehydrogenase. 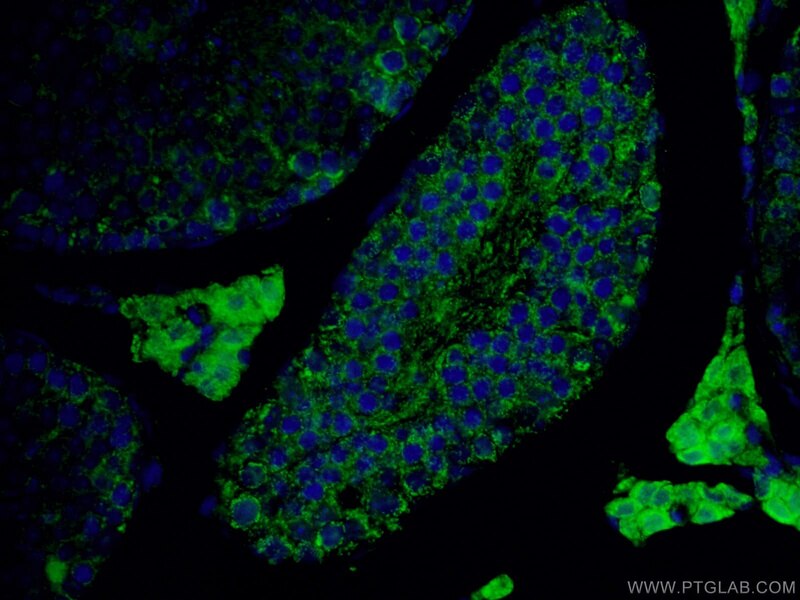 ALDH1A1 plays a critical role in protection against oxidative stress-induced cytotoxicity in lens epithelial cells(PMID:19296407). 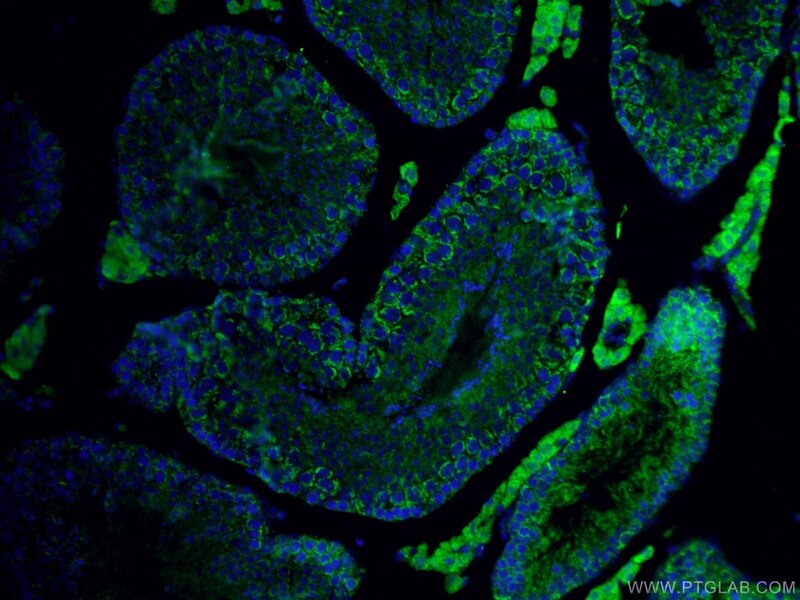 And it is important for multiple biological activities including drug resistance, cell differentiation, and oxidative stress response(PMID:19025616). 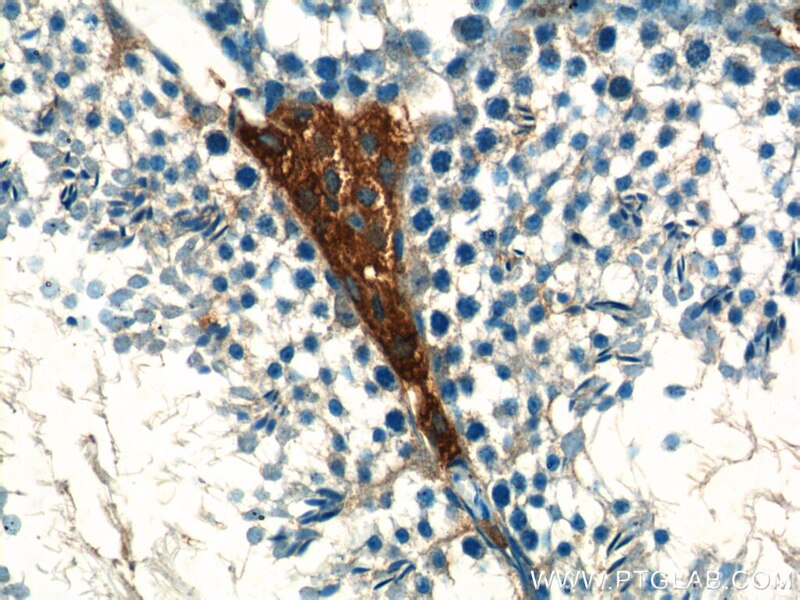 As a novel cancer stem cell marker, ALDH1A1 can be used for tumors whose corresponding normal tissues express ALDH1 in relatively restricted or limited levels such as breast, lung, ovarian or colon cancer(PMID: 20422001). 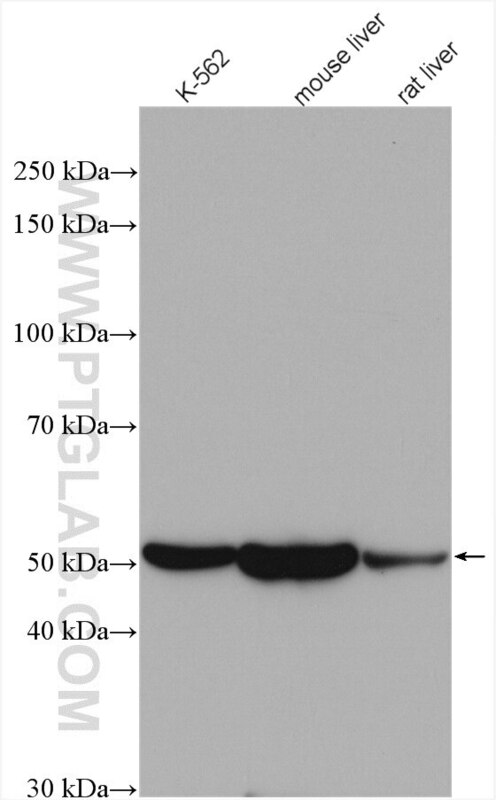 This antibody can also recognize some other membranes of the aldehyde dehydrogenase family. 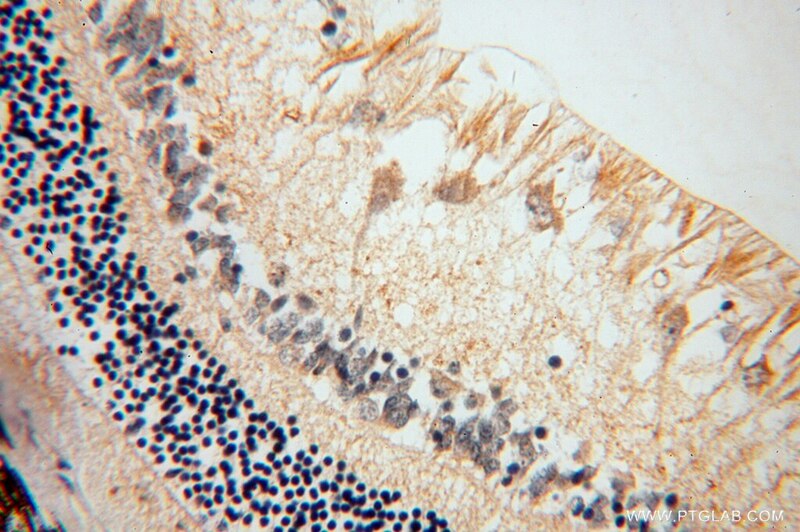 Properties of lewis lung carcinoma cells surviving curcumin toxicity. 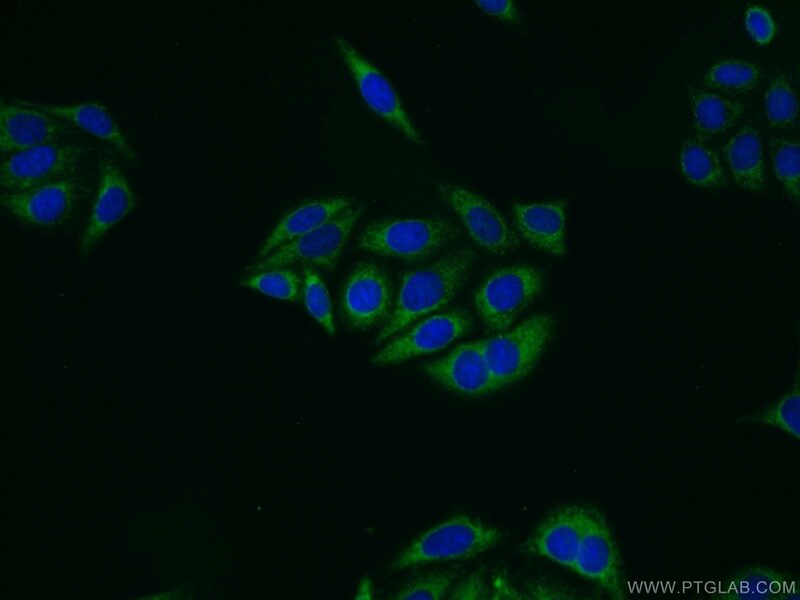 Effects of curcumin on stem-like cells in human esophageal squamous carcinoma cell lines. Correlation of ALDH1, CD44, OCT4 and SOX2 in tongue squamous cell carcinoma and their association with disease progression and prognosis. 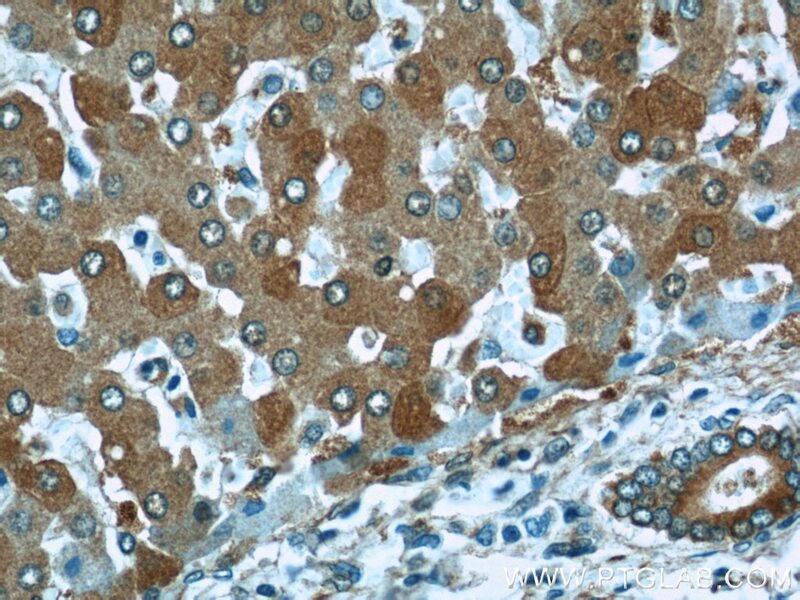 CD163+ Tumor-Associated Macrophages Correlated with Poor Prognosis and Cancer Stem Cells in Oral Squamous Cell Carcinoma. 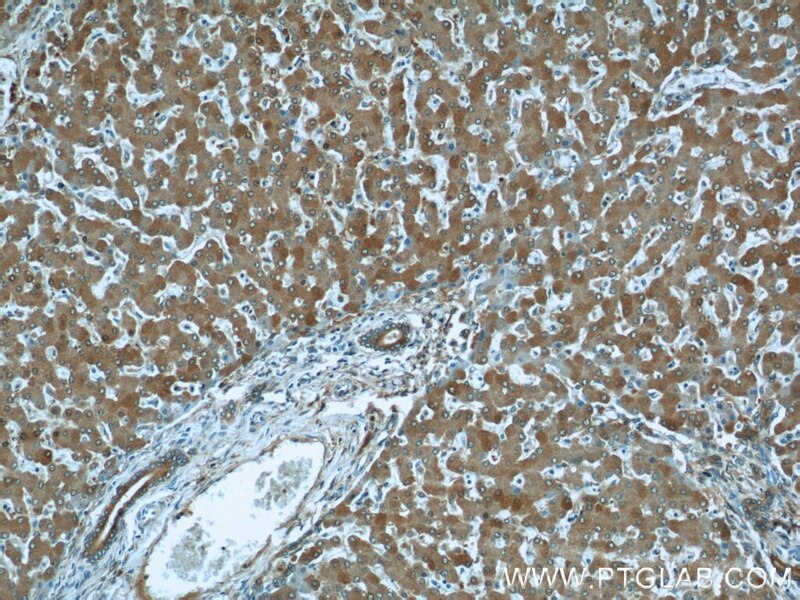 Anterior gradient protein 2 expression in high grade head and neck squamous cell carcinoma correlated with cancer stem cell and epithelial mesenchymal transition. 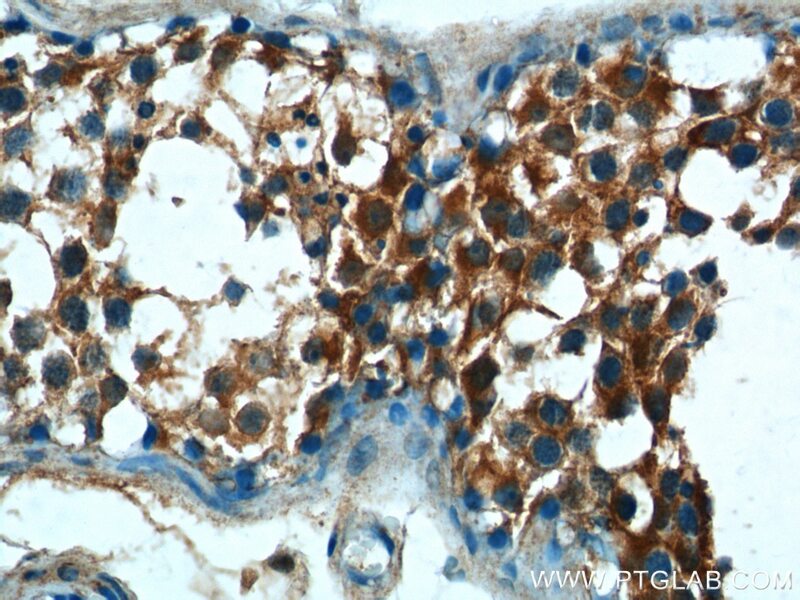 Immunohistochemical analysis of paraffin-embedded mouse testis tissue slide using 15910-1-AP( ALDH1A1 Antibody) at dilution of 1:200 (under 10x lens). 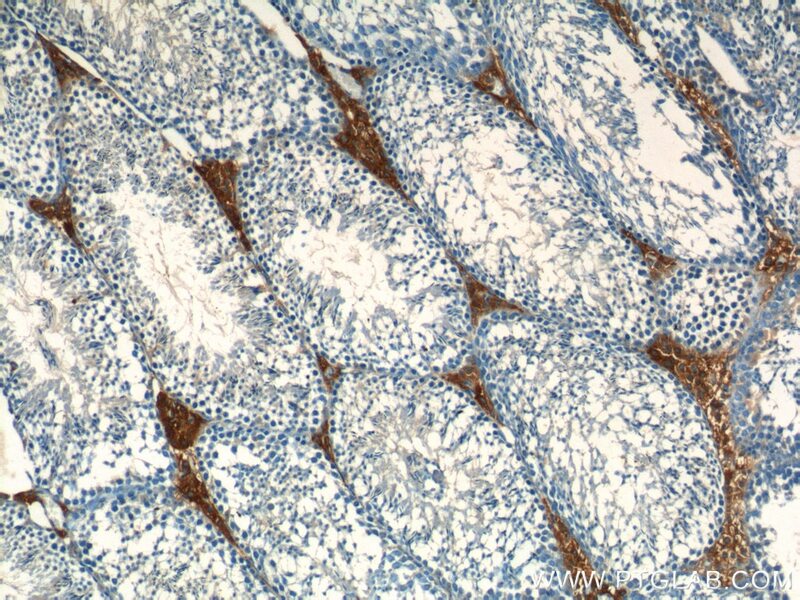 Immunohistochemical analysis of paraffin-embedded mouse testis tissue slide using 15910-1-AP( ALDH1A1 Antibody) at dilution of 1:200 (under 40x lens).